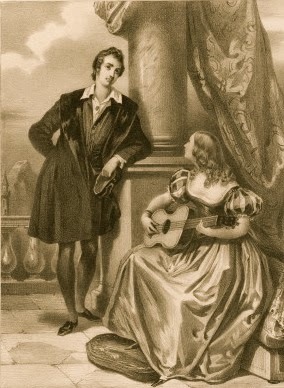 John Glassco considered Byron's Goose his "one great play". Daytime soaps and radio drama aside, I've had no experience writing scripts, so won't presume to judge. 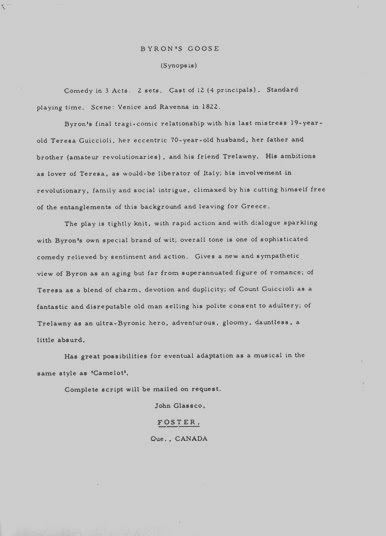 That said, I am confident in deeming it superior to The Augean Stable, a very loose adaptation of Harriet Marwood, Governess, the only other work Glassco composed for the stage. 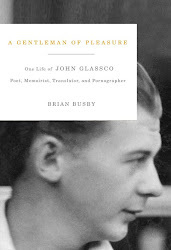 John Glassco, that self-proclaimed "great practitioner of deceit," made a very fine book thief. 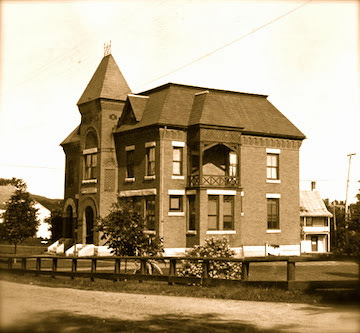 His personal library, most of which was purchased by Queen's University, includes volumes lifted from the Westmount Public Library and the Royal Edward Laurentian Hospital. 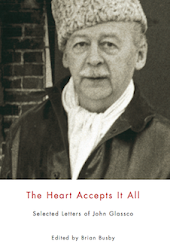 Glassco's letters are addressed to a veritable who's who of Canadian and international literati: the Margaret's (Atwood and Laurence), Northrop Frye, F.R. 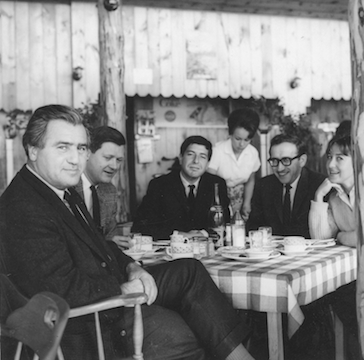 Scott, Irving Layton, Malcolm Cowley, and Leon Edel, among others. Glassco enjoys caricaturing people based on their physical appearances, and can be vicious in his assessments (referring to a documentary about Leonard Cohen, he expresses shock that the National Film Board "was induced to collaborate on the indulgence of a 5th-rate poet's megalomania"). 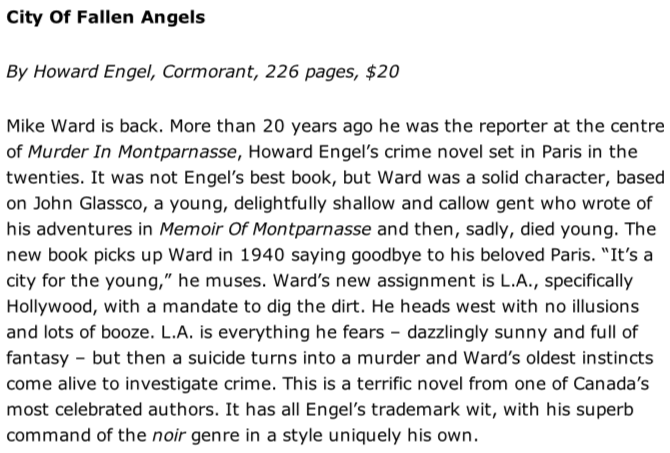 Morley Callaghan, in particular, is subject of repeated salvos. 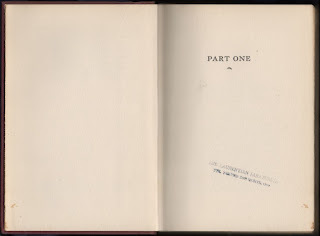 And yet the correspondence also displays the workings of an adroit and capable literary mind (his assessments of the Marquis de Sade and D.H. Lawrence are cogent and persuasive), and a man with a keen understanding of the business side of publishing. 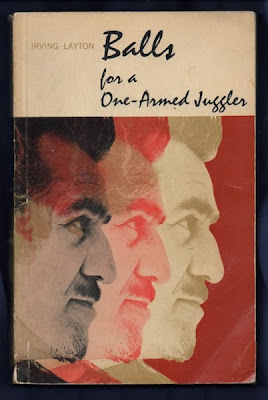 There is a certain amount of the quotidian details and repetition one might expect from a collection of personal letters (Busby points out that none of the entries has been edited), but overall the book provides an interesting glimpse into the private world of one of Canada's most enigmatic literary figures. More in the November issue of Quill & Quire! And what better day than today? 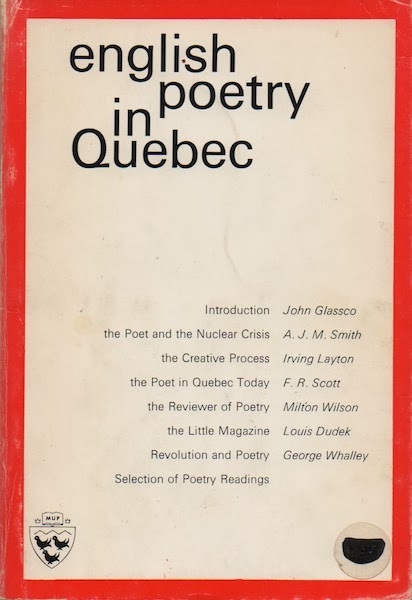 'Twas fifty years ago – 12 October 1963 – that Glassco's Foster Poetry Conference opened at the Glen Mountain Ski Chalet. With Glassco, F.R. Scott, A.J.M. 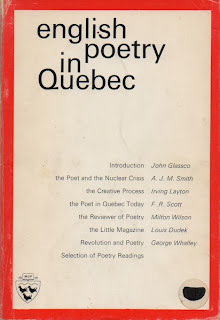 Smith, Irving Layton, Louis Dudek, Ralph Gustafson, Eldon Grier, D. G. Jones, Leonard Cohen, Leonard Angel, Kenneth Hetrz, Henry Moscowitz and Seymour Mayne, it remains the greatest gathering of Quebec's English-language poets. Three days of poetry, comradeship and drink, even the most subdued reports paint it as a great success. 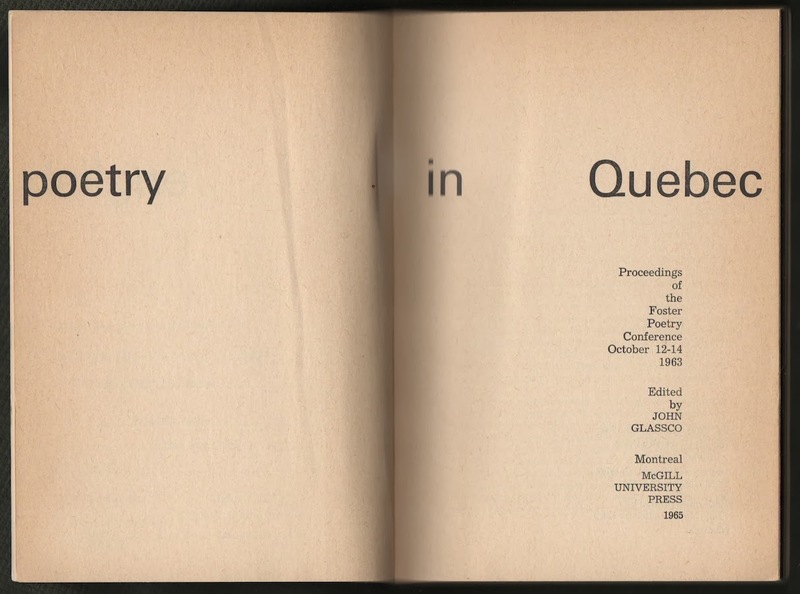 Scott was so fired by the experience that he pressured Glassco to edit the proceedings for McGill University Press. Glassco agreed to take on the project, but soon came to recognize that the contents failed to capture anything of the exuberant nature of the conference. The late night conversations, the raw exchanges, the drinking – almost all that had been informal, spontaneous, and dynamic had been left unrecorded. What's more he found work on the book a "horrible bore." 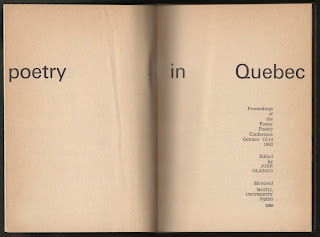 On 4 May 1964, he wrote Jean Le Moyne: "I shall never be an editor again: this is the work for professionals who have secretaries, electric typewriters, photocopy machines, the co-ordinative faculty and endless patience: but the book is now ready for press." 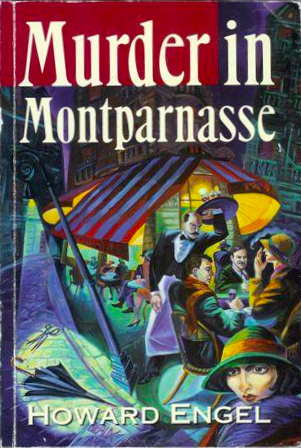 When the galleys arrived Glassco found the quality so poor that the November 1964 publication date had to be scratched. For months the anthology hung over his head as he awaited, with dread, the reset galleys. What arrived was much improved and he moved quickly to clear the sheets from his desk. Then, just when his work appeared to be finished, Glassco discovered that he'd been saddled with the task of distributing payments to the twenty contributors. The irritation was only compounded by the small sums. 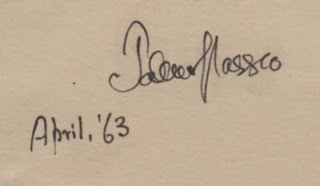 Leonard Cohen received three dollars, barely enough to purchase a copy of the book. My work in editing Glassco's letters was much more pleasurable.